This splint design can be used to improve the alignment of strongly deviated fingers, which is in many cases caused by rheumatoid arthritis. An ulnar drift deformity is characterized by ulnar deviation and volar subluxation of the metacarpal phalangeal (MCP) joints. In rheumatoid arthritis, chronic inflammation of the MCP joints and many other contributing factors cause damage to the joint capsule and surrounding ligaments resulting in this deformity. This deformity has functional and esthetical implications and is often accompanied by wrist deviation and other extremity deformities as well. 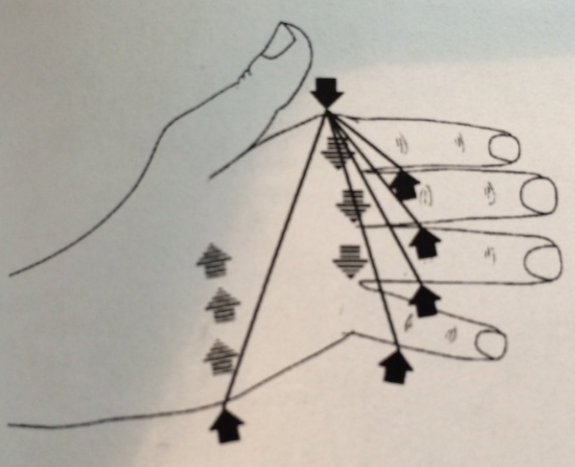 As the ulnar shift must be corrected, it is highly recommendable to use a lever system (see figure below). In addition, it is also advisable to pull rather than push in order to obtain a comfortable correction, which explains the position of radial bar at the level of the MCP and first phalanx. Therefore it is very important that this part of the splint is moulded correctly (correct position and covering enough surface) and that extra padding (Luxofoam) is provided to prevent overpressure. The piece/bar which covers a small part of the palmar surface must also be shaped and moulded in such a way that it conforms to the anatomy of the distal border of both the thenar and hypothenar musculature. These crucial points contribute to overall patient comfort. In some cases, it may be advisable to support the MP joints in extension, to avoid a worsening of MP subluxation. The ulnar drift splint is recommended for persons whose ulnar deviation at the MCP joints can be corrected with mild to moderate force. The splint fits the top of the hand and allows free hand function during day-time wear as the palm of the hand is free enough for gripping objects. The splint allows straightening of the fingers and PIP flexion as well. The finger straps can be opened and closed to control the amount of force, which also makes the splint easy to don and doff, even if the fingers are swollen. To be sure that the patient will put and will remove easily his/her orthosis, it is necessary to mould it in an oblique way on the back of the hand as shown on the drawing. This hand-based ulnar drift splint is an esthetically appealing, lightweight and low cost solution as it doesn’t require much material. For the fabrication of the hand-based base it is recommended to use a firm and rigid (3.2 to 3.4mm) material which is stretchable, elastic, and conforms easily to the patient’s anatomy. Orfit Classic Stiff, Orfit NS Stiff, Aquafit NS Stiff, Orfit Colors NS or Orfit Strips are excellent material choices as their characteristics include great mouldability and rigidity at the same time. On top of this splint base a suitable (5mm wide) Velcro loop tape can be attached. This piece of Velcro can be cut into several smaller strips, running from palmar to dorsal side to support volar subluxation and allowing to correct each finger individually. Each finger strap can be fastened and attached onto the dorsal aspect of the previous (radial) strap by using self-adhesive hook tape. For further splint instructions we invite you to take a look at the educational corner on our website. This functional corrective splint is worn during day-time. reduce MCP joint subluxation by supporting the phalanges.